Dimitri Bontinck spoke with the press at Antwerp's main courthouse in February, when his son Jejoen was among those on trial for taking part in a terrorist organization that allegedly recruited fighters for jihadi groups in Syria. Dimitri Bontinck, right, took part in a 2013 meeting in Brussels with parents of other young Belgian men who'd left to fight in Syria. 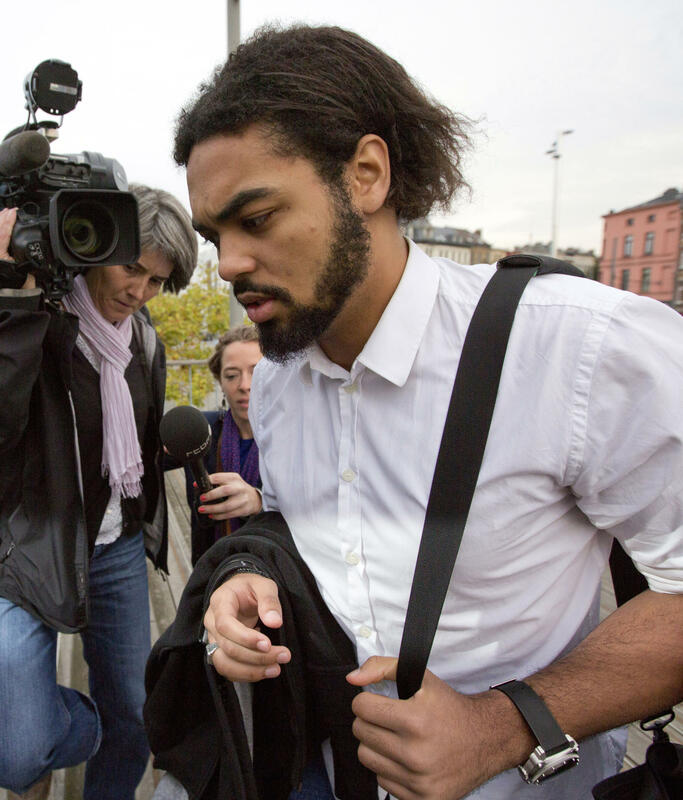 Jejoen Bontinck, shown here arriving at an Antwerp courthouse for his trial in 2014, was given a 40-month suspended sentence. The Paris attacks have brought new attention to Dimitri Bontinck, a member of Belgium's Dutch-speaking majority. His life was dramatically changed a few years ago, when his then-teenage son converted to Islam and went to Syria to join Islamist fighters there. Now Bontick is trying to prevent other young Europeans from following the same path. Bontinck says his son, Jejoen, was raised as a typical Western boy, the child of an atheist father and a Catholic mother. But then, Bontinck says, Jejoen began dating a Muslim woman, joined a radicalization group and wound up in Syria in 2013, where he spent nearly nine months — most of them in misery. "I think he was almost six months a hostage" of his Islamic captors, says Bontinck, "because they suspected [he] really was a spy." Bontinck first made headlines when he went to Syria after his son. He went several times and says he was captured and tortured by Islamists, but finally managed to bring Jejoen back to Belgium, where Jejoen received a suspended sentence after cooperating with authorities. 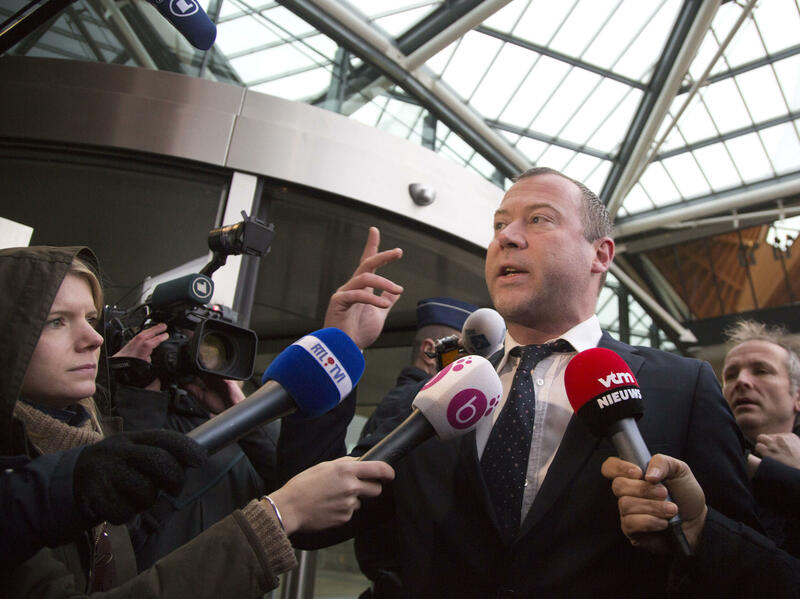 Since his son's ordeal, Bontinck has acted as a consultant, giving presentations in schools and elsewhere, trying to convince other young people in Belgium not to fall for the recruiting lures used by Islamist groups. He freely admits he's no longer the same tolerant Westerner he once was. He believes many Islamist groups abuse Europe's laws protecting freedom of religion and expression to run shadowy recruiting efforts that the Belgian government has been unable to deal with. "There is no deradicalization project in Belgium," Bontinck says. He believes that the Belgian link to the Paris attacks proves that his government's scrutiny and control of suspected Islamists is clearly inadequate. "They really need, not only in Belgium, but worldwide, more infrastructure, more technology, more budgets, more workers to save our nations, and our security of our people, you know?" he says. When asked if that won't also mean less freedom, less democracy — less of the Western values that the European Union is supposed to stand for — Bontinck sighs and nods. "Do we want to live in the near future in a police state, [where] everybody is controlled by the government and by the police?" he asks. "Well, I'm sorry to say that [for] the security of our nations, all Western nations, it has to be this way." It's a view that many Europeans would reject out of hand. Even Dimitri Bontinck would have — before his son's traumatic experience among the Islamists in Syria. One of those young radicals from Belgium is the subject of our next story. He was a Belgian teenager who converted to Islam and later went to Syria to join fighters there. NPR's Peter Kenyon met up with his father, who is now trying to prevent other young Europeans from following the same path. PETER KENYON, BYLINE: Dimitri Bontinck is part of Belgium's Dutch-speaking majority. He says his son, Jejoen, was raised as a typical Western boy. But then, Bontinck says, his son began dating a Muslim girl, joined a radicalization group and wound up in Syria, where he spent nearly nine months, most of them in misery. DIMITRI BONTINCK: From that nine months, I think he was almost six months hostage. Because they suspected he really was a spy, they called his father to come and rescue him. KENYON: Bontinck did go to Syria after his son. He says he was captured and tortured but finally managed to bring Jejoen back to Belgium. Since then Bontinck has acted as a consultant giving presentations in schools and elsewhere, trying to convince other young people not to fall for the recruiting lures used by Islamist groups. He freely admits he's no longer the same tolerant Westerner he once was. He believes many Islamist groups abuse Europe's laws defending freedom of religion and expression to run shadowy recruiting efforts that the Belgian government has been unable to deal with. BONTINCK: There is no de-radicalization project in Belgium. In the whole entire world, there is only four countries where there is a de-radicalization project, it's Holland, Swiss, Denmark and Saudi Arabia. KENYON: As for programs in other countries, he dismisses them with an expletive. Bontinck believes that the Belgian link to the Paris attacks proves that the government's scrutiny and control of suspected Islamists is clearly inadequate. BONTINCK: They really need - not only in Belgium, but worldwide - more technology, more budgets, more workers to save our nations and our security of our people, you know? KENYON: Doesn't that also mean less individual freedom, less democracy, less of the Western values that are supposed to be the whole point of the EU? KENYON: Yeah, he sighs, before putting it more bluntly, saying, do I think we need to live in a police state? BONTINCK: Well, I'm sorry to say, in the security of our nations - Western nations - I think it's necessary. KENYON: It's a view many Europeans would reject out of hand, even Dimitri Bontinck - before his son's dramatic experience among the Islamists in Syria. Peter Kenyon, NPR News, Brussels. Transcript provided by NPR, Copyright NPR.